We use the word “aware” to note that we are continuously seeking more knowledge about how we can improve. We use the word “choices” to note that we consider many options and choose those in our best interest. The lifestyle choices you make will and do have a huge influence on your health and your wellness. The secret isn’t in healthcare, but healthy and consistent self-care. While traditional (Western) medicine is focused on alleviating disease, the wellness approach to things encourages you to take responsibility for your own personal well-being. 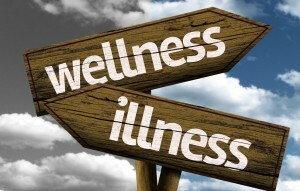 Wellness is much more than simply an absence of illness and/or disease. Wellness is a proactive and preventative approach that’s designed to provide optimum levels of health, emotional and social functioning. Wellness emphasizes the whole individual and the understanding that everything we do, feel, think and believe has a direct impact on your state of health. Ultimately It’s an on-going process of making deliberate choices to enhance the quality of your life, is a journey not a destination, success is achieved with each small manageable step you take to enhance your sense of well-being. It’s a deliberate, holistic and proactive approach to achieving optimum health and not just the absence of disease. Living well involves adopting behaviours to care for yourself physically, emotionally, socially, intellectually, spiritually and vocationally.